OK, I promise that this is my very last chocolate peppermint dessert of the season. I’ve been mildly obsessed with raw cacao and peppermint extract. But, hey! Who doesn’t love gummy treats? 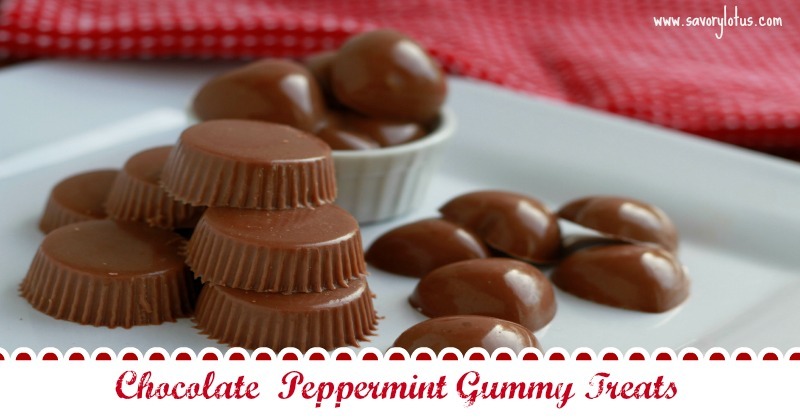 So here is one more holiday reipe for you: Chocolate Peppermint Gummy Treats. We don’t take a lot of supplements at our house, but gelatin is definitely something we consume on a regular basis. There are so many health benefits of gelatin that I make sure to get as much into our diets as possible. Making homemade bone broth is my favorite way to get gelatin into my diet. Strong hair, nails, bones, and teeth, as well as a healthy gut lining are good things to have. Right? Read more HERE on the health benefits of gelatin. But my family LOVES when I make gummy treats. Raspberry, Strawberry, Coconut Mango… they don’t care. They love them all. But this recipe is just for me. After making my Peppermint Chocolate Cookie Balls and my Flourless Peppermint Brownies, I was hooked on the rich taste of raw cacao and peppermint together. So why not make them into a gummy treat? This recipe works great with cute little molds like THIS but you can just pour it into a glass baking dish and cut after it sets. Like I said before, these little gummies were made for me. Unfortunately, my family found them and quickly decided that these were their favorite kind. I guess I have to make a double batch next time. ENJOY! Gently warm coconut milk and raw cacao in a medium pot. Whisk in gelatin 1 TBS at a time until completely dissolved. Remove from heat and stir in honey and peppermint extract. Pour into molds or glass baking dish. Place into fridge to set for at least 2 hours. I happened to have all the ingredients on hand & whipped these up tonight. They are delicious. Thank you. Oh, good! I’m glad you liked them. They are my personal favorite right now. 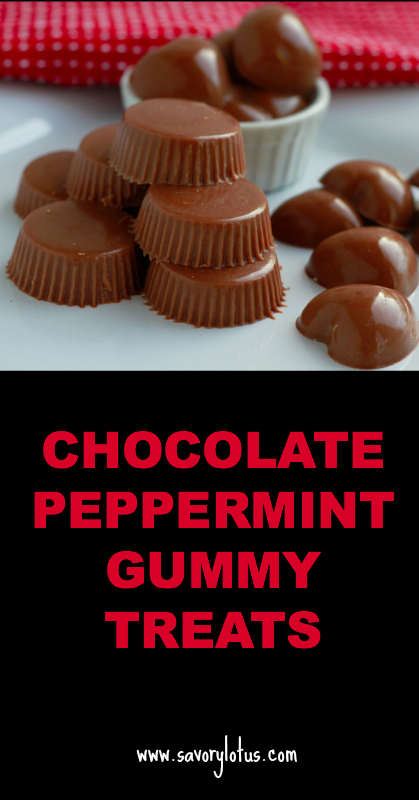 Have you tried this with peppermint essential oil? I haven’t but I bet it would be fabulous! 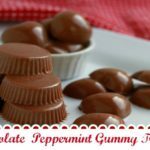 I’m not crazy about mint-chocolate combos but I was wondering if you think vanilla would be a good replacementfor mint. I don’t see why not, but just wanted to see if it has been tried. I think vanilla would be delicious with these gummy treats! Can I substitute raw milk for the coconut milk? 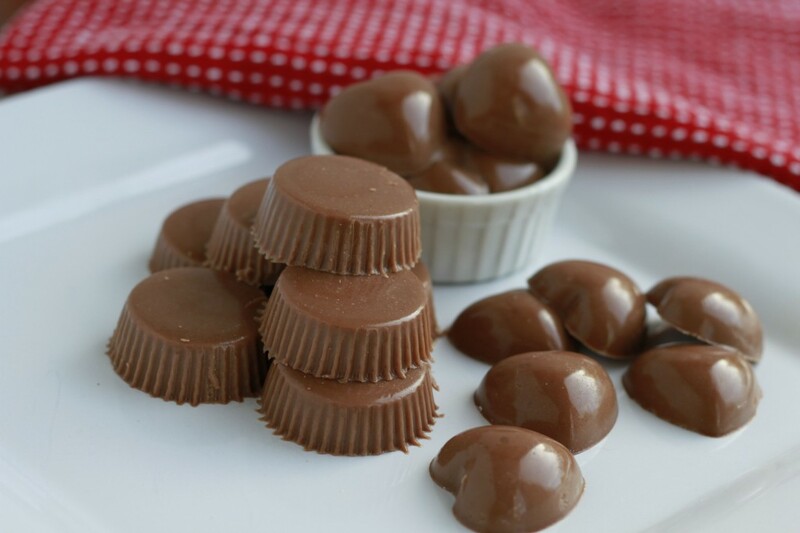 Hi Katja – I made these and they are delicious! My niece and nephew loved them. Did you see the warning about Nativas cadmium levels? Was very disappointed about this. Hi, Jill! Glad you guys liked them. I had not heard that. Off to research it now. Thanks for the heads up! Do these have to remain refrigerated? Hi! What is the volume of one can of coconut milk, please? We have a few different sizes in Australia, commonly 270ml (8oz?) And 400ml. I’m guessing you’re using 400ml, but wanted to check. Thanks. These are delicious.I left out the peppermint, as we don’t like peppermint-chocolate combo, and used vanilla extract.Next time I will have to half the recipe as I did not have enough room for all the molds (I used 4 of the silikomart brand and some leftover).My only problem is that the bottom has a layer of fat from the coconut milk and my kids don’t like that.What can be done about that? Hmmm… I have never had my coconut milk separate before. What brand did you use? Did you get the mixture too hot- like was it boiling? I’m just trying to figure out what made it separate. I make gummies all of the time with coconut milk and haven’t seen this.